There’s just one problem with this line of thinking. Economic growth—our raw output of goods and services—is a questionable measure of our success or well-being as a nation. Growth, in some cases, runs counter to priorities that matter deeply to our people. As a short-term measure of national production, GDP often tends to increase as rates of crime, pollution, and household debt rise. Both Hurricane Sandy and the BP Deepwater Horizon disaster arguably boosted economic growth because of the activity associated with cleanup and rebuilding. 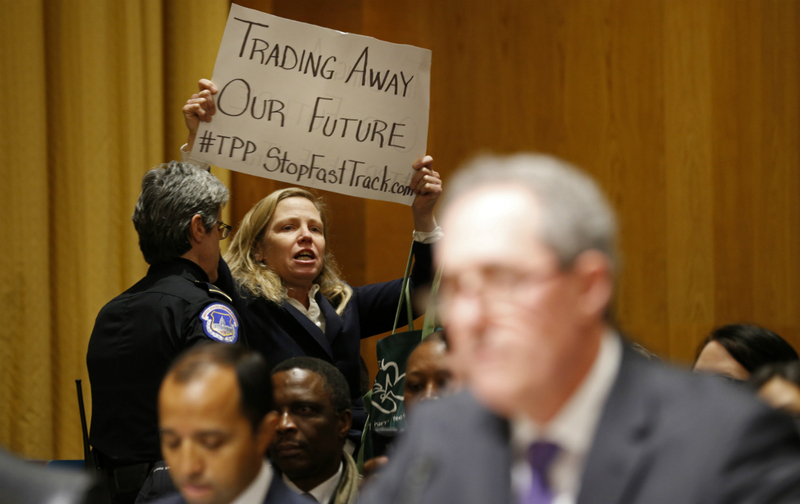 It’s hard to imagine the TPP passing muster when we consider values other than economic growth. Start with jobs and living standards. What Nobel laureate Paul Samuelson wrote in 1955 rings true today: under a system of free trade, “national product would go up, but the relative and absolute share of labor might go down.” It’s a polite way of saying that free trade means more opportunity for big industry and investors, but that workers will face new threats to their jobs and wages. This is particularly true when we open up to direct competitions with countries like Vietnam—a TPP participant country where the minimum wage runs below 60 cents per hour. As economists David Autor, David Dorn, and Gordon Hanson have shown, increasing direct competition with a larger low-wage country, China, has increased unemployment and lowered wages in the United States. While workers disadvantaged by trade are supposed to be compensated with Trade Adjustment Assistance funding for retraining assistance and income support, the funding, at least since the NAFTA era, has never added up to the amount of the losses. Nowhere is this more evident than in my Detroit-based Congressional District, where outsourcing decisions in the wake of NAFTA have meant much more than lost jobs and wages: The trade deals have meant a vicious cycle of abandoned production facilities, lost population, a diminished municipal tax base, lower funding for key city services like drinking water, and, in turn, more population loss. “Adjustment assistance” can hardly begin to compensate for this. No marginal increase to GDP can justify the suffering and lost opportunity. As for health and the environment, both the TPP and the forthcoming Trans-Atlantic Trade and Investment Partnership present a series of unforeseen risks that cannot be easily quantified in economic terms. Consider how a key element of the trade deals known as the Investor-State Dispute Settlement (ISDS) mechanism would allow foreign corporations to challenge US health, safety, and environmental protections. If US regulators ban production of a toxic chemical manufactured by a foreign firm for fears that it may end up in our food system or in our air, the manufacturer of that chemical could, under the terms of a trade agreement, challenge our government before a special international ISDS tribunal for frustrating its expectations and ultimately demand compensation for anticipated future profits. The special tribunal—often comprised of highly compensated corporate lawyers rather than professional judges—could require US taxpayers to pay the firm millions in damages, and the ruling could not be challenged in our domestic courts. This shadowy system is already the reality under NAFTA and other trade agreements, and it would be expanded dramatically under the TPP. Under the existing deals with this parallel legal system for foreign corporations, a Swedish company has sued Germany because the German government decided to phase out nuclear power after the Fukushima disaster, a US firm has sued Canada for a fracking moratorium along the lines of the one in New York, and the tobacco giant Philip Morris has sued Australia and Uruguay for implementing anti-smoking laws. It’s easy to imagine a carbon tax or other future action to stop climate change coming under attack from corporate polluters in an ISDS court. Just the possibility of such lawsuits could dissuade local, state, and national governments from taking needed steps to protect citizens from environmental or health risks. The tradeoff inherent in the Trans-Pacific Partnership—risking wages, health, and environmental standards in exchange for the promise of some additional economic growth—is a terrible deal for most Americans. It’s an even worse deal when you consider that, according to recent estimates by the US Department of Agriculture, the quantifiable economic growth will be negligible and accrue mostly to multinational corporations seeking to expand their reach. So why are prominent politicians across the political spectrum pursuing the deal? While some argue that it’s a matter of exercising foreign-policy leadership in Asia and containing China, these rationales collapse under closer scrutiny. As numerous US officials have reiterated, China is itself free to join the trade pact. A 2013 report by the Pentagon’s Defense Science Board made the case that the offshoring of the US manufacturing base—a process accelerated by TPP-style trade agreements, including NAFTA—presents a critical risk to US military readiness. As Public Citizen’s Global Trade Watch has documented, erroneous foreign policy and national security arguments are frequently used as “the sales pitch of last resort” for controversial trade agreements. Here’s the real reason the TPP remains on the Washington agenda: The political philosophy that Jeb Bush extolled during his visit to Detroit—economic growth above all—remains the order of the day among the nation’s top policymakers. If we are to succeed in restoring our battered manufacturing base, rebuilding our great cities, defeating climate change, and protecting the health and safety of our citizens, we need a new worldview in Washington—one that enshrines real human thriving rather than raw output. The looming battle over trade policy pits Jeb Bush’s worldview squarely against Robert F. Kennedy’s. It’s an open question which side many of my Democratic colleagues in Congress will choose.